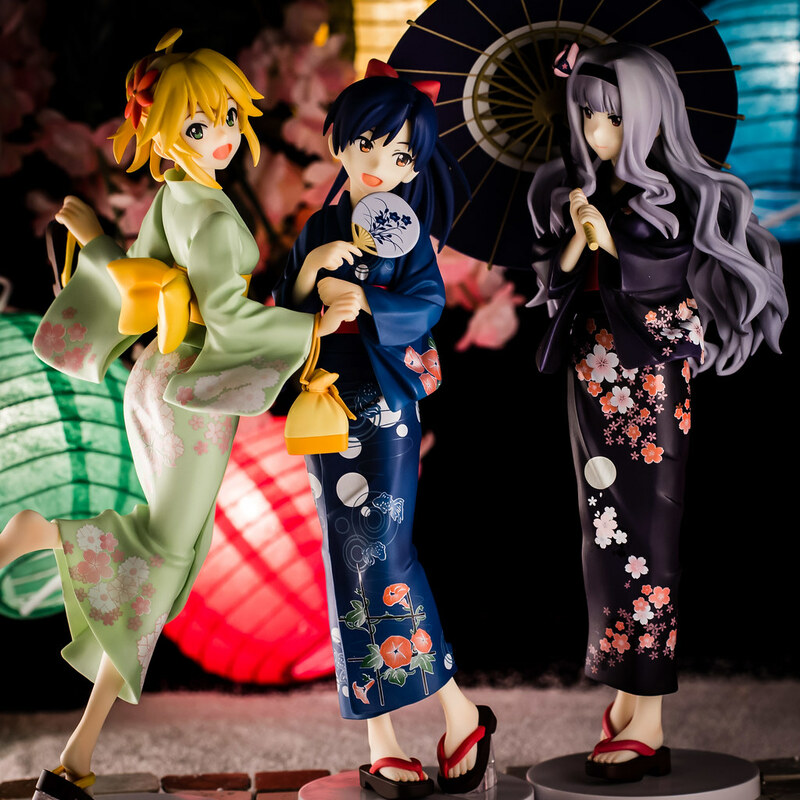 Hoshii Miki, Kisaragi Chihaya and Shijou Takane Yukata ver. Hey peeps! Hows are the cooling days treating you? I decided to have one last reminder of summer with a nice look at my favorite 765 Pro trio. 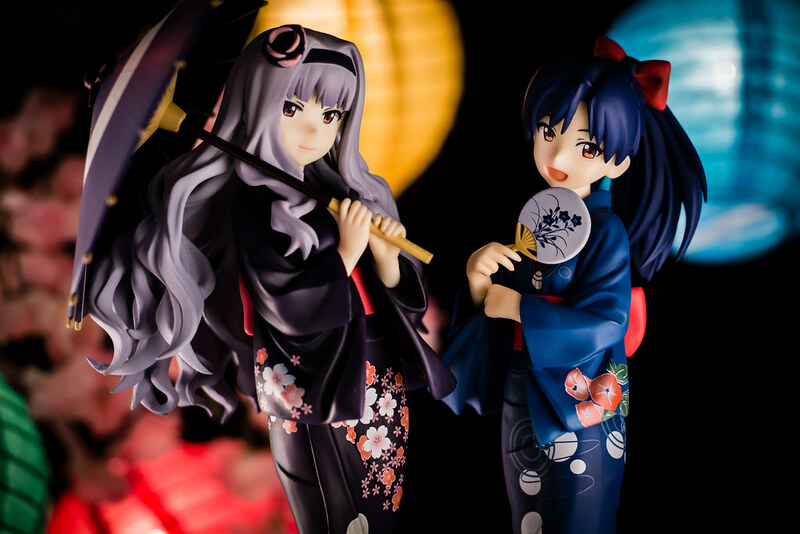 FREEing provided the perfect set of figures for me with their Chihaya, Miki and Takane from the nice classic The IDOLM@STER. 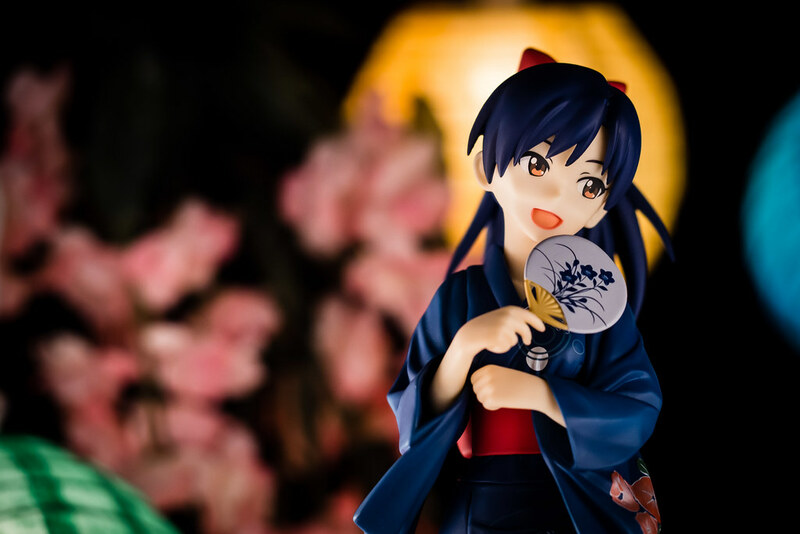 Nothing like pretty idols in yukatas to remind you of summer. I'm not one to usually buy complete sets of scaled figures. Price is definitely the major factor for my decision not to. This is followed by the characters themselves, very rarely do I feel attachment to all the characters in a set that I find it I would like to get them all. The last reason is the typically large gaps between releases. It was quite unexpected for me when all three those fell to the wayside... mostly anyways. 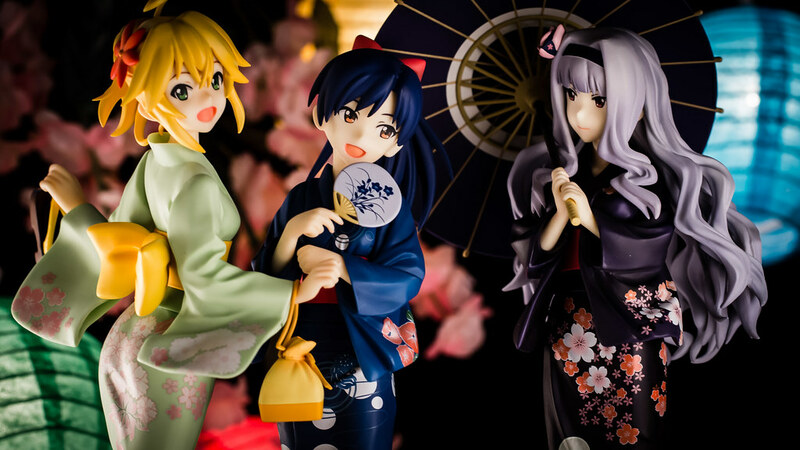 The average price that I paid for each of the girls was around 7500 yen. Still pricey indeed but definitely a far cry from the typical 10,000 + yen prices that are becoming increasingly common. If you ask who are my top three favorite girls from 765 Pro you are looking at them right now. Amazingly enough all three were released in about a month, I find that nothing short of miraculous when it comes to figure releases period. Essentially, the stars just aligned for me when it came for these beautiful set of figures. 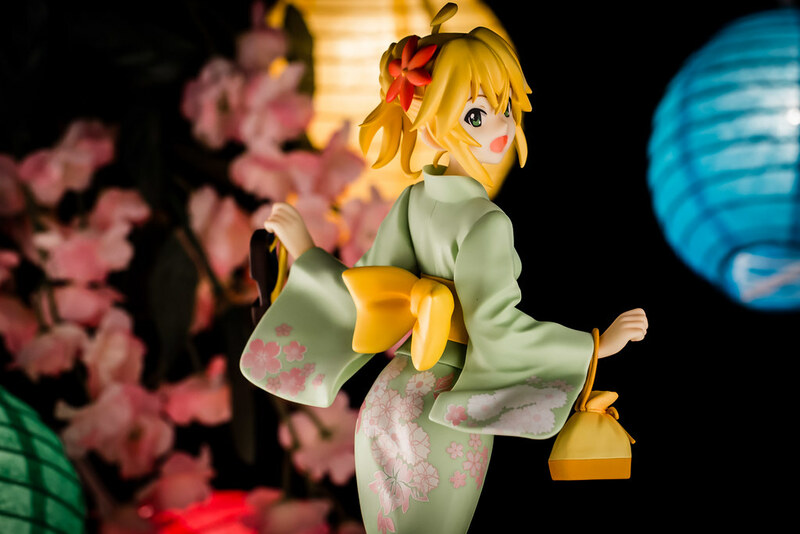 Let's start off with Miki, I talked a bit about her last time when I showed off my super nice prize figure of her. To recap, Miki is the best idol, the idol of idols! This rendition of Miki is just so super nice to look at, I just can't but help feeling re-energized when I do so. This definitely Miki when she is on her "on" mode. 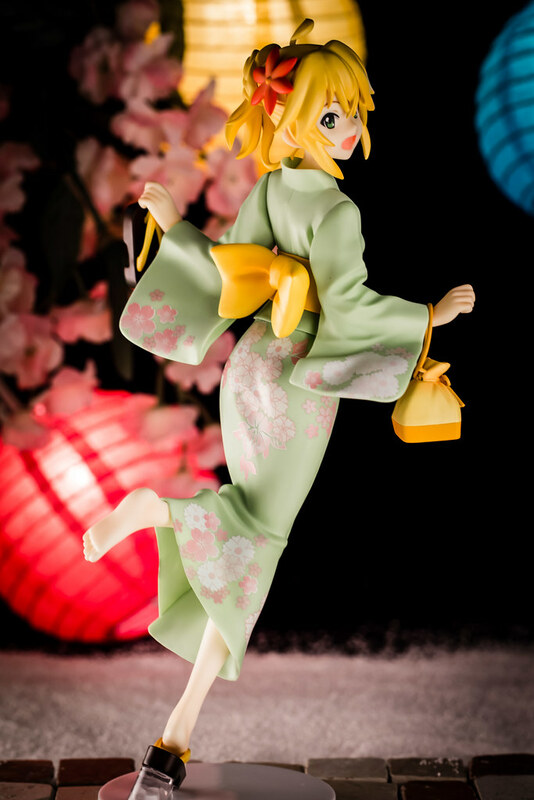 I am just so in love with her nice dynamic pose, I can just picture her calling out to her "Honey" as she excitedly runs off. Out of the three girls Miki is definitely the one with the most energy and excitement. 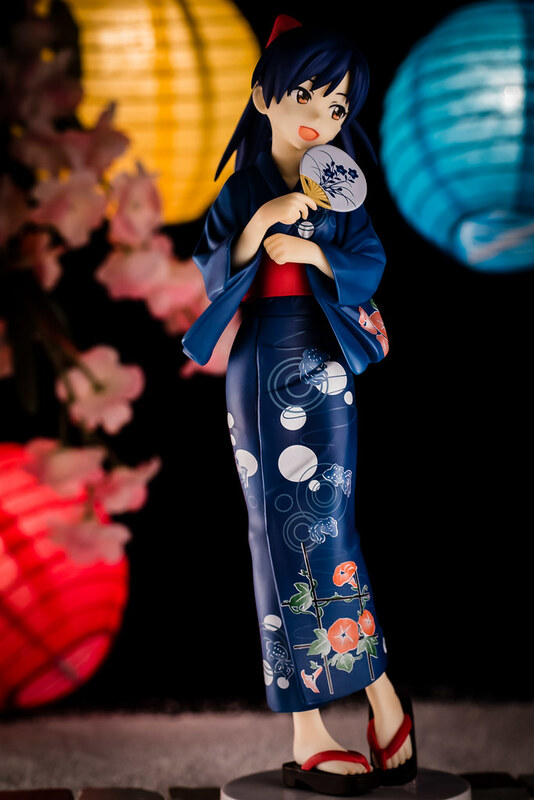 The yukata shows off her a different shade than her typical signature color but looks really well. 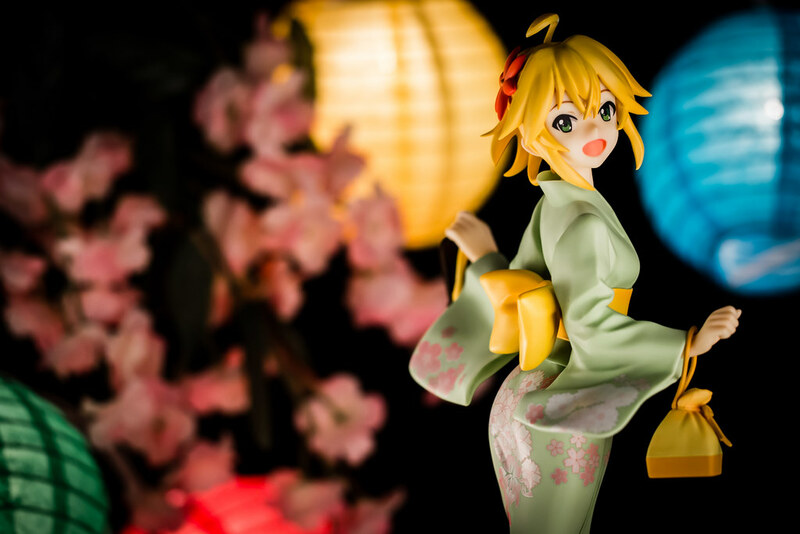 The accents of yellow from her obi, bag and geta go well with her overall theme. 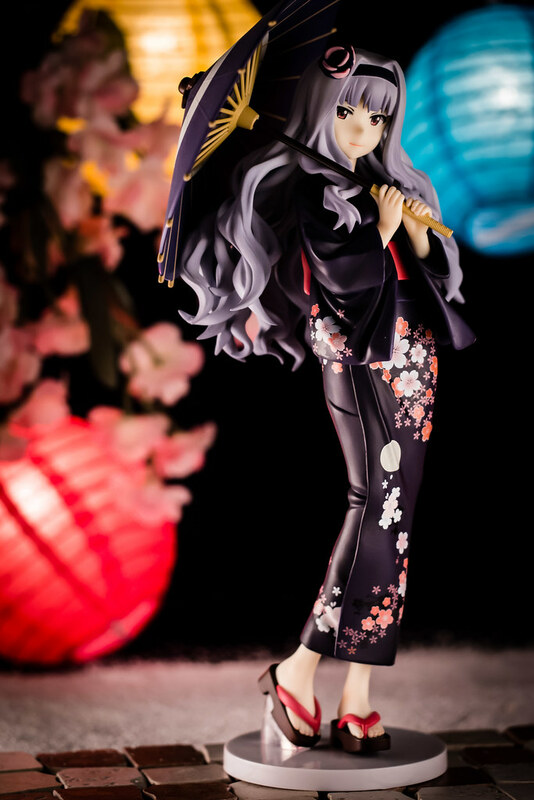 The flower patterns on her bring that nice girlish charm as does the flower adorning her hair giving a nice contrast. I'm quite pleased as a Miki fan with this rendition of her. My only complaint is that her base is a tad too small, as Miki is leaning forward her center of gravity causes her to topple easily. In fact while taking photos she went face first to my desk a few times, I'm super glad nothing really happened to her. 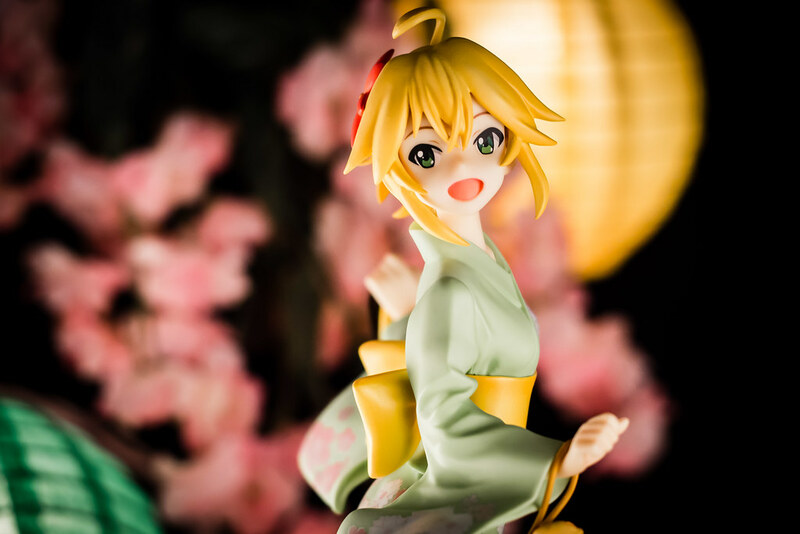 Other than that, I'm happy I added my second Miki figure to my collection. 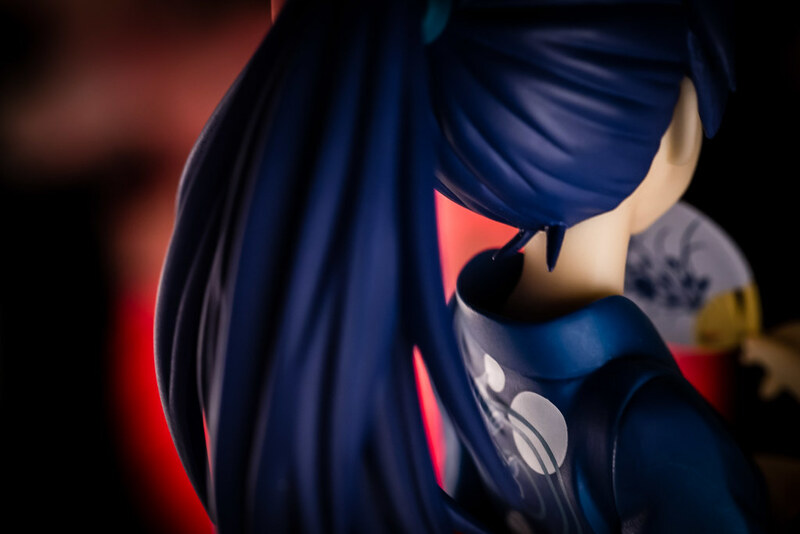 On the other end of the spectrum on several fronts we have the stoic Chihaya. 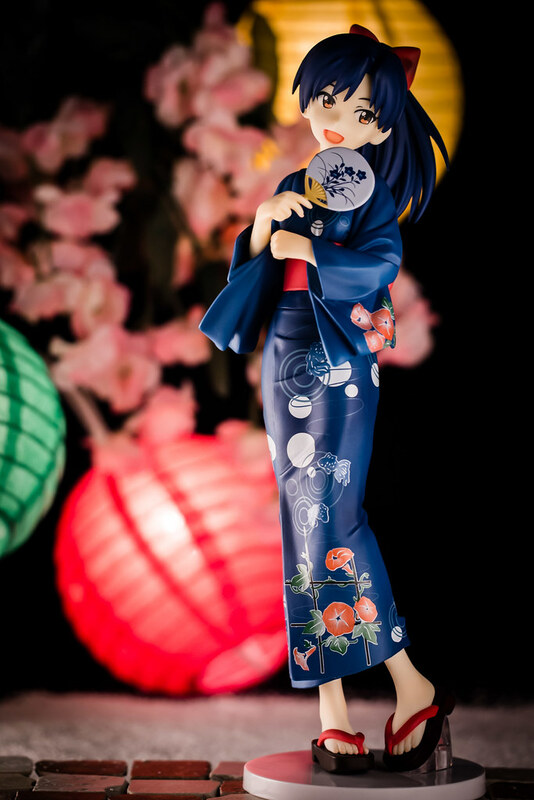 Oh boy, don't you all love Chihaya? I just love her depiction as the best singer in universe, this is one of those rare occasions where I just find the casting perfect. I mean , have you guys heard Isami Amai singing Arcadia? It's just sooooo darn good. I also like her sense of humor, I always found the contrast of her fairly serious persona and when she breaks up laughing over the silliest of things. Like that one time with the box and Haruka. My favorite thing about her is how she is damaged goods thanks having "murdered" her little brother. All the delicious drama that resulted from that, the amazing recovery together with the rest of the 765 Pro girls, if there was one overarching storyline to pursue in the anime that was the best pick! 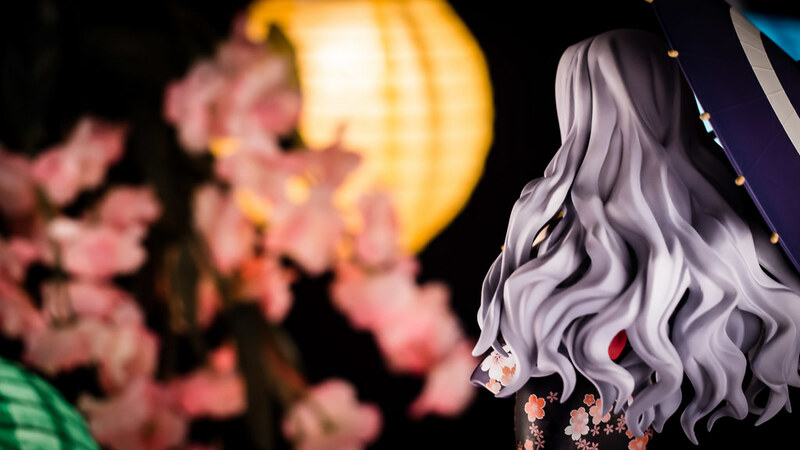 Chihaya's slim profile definitely works well with a yukata, the line of her body is very lovely to look at. The pattern with the fish and the ripples are just nothing short of beautiful. 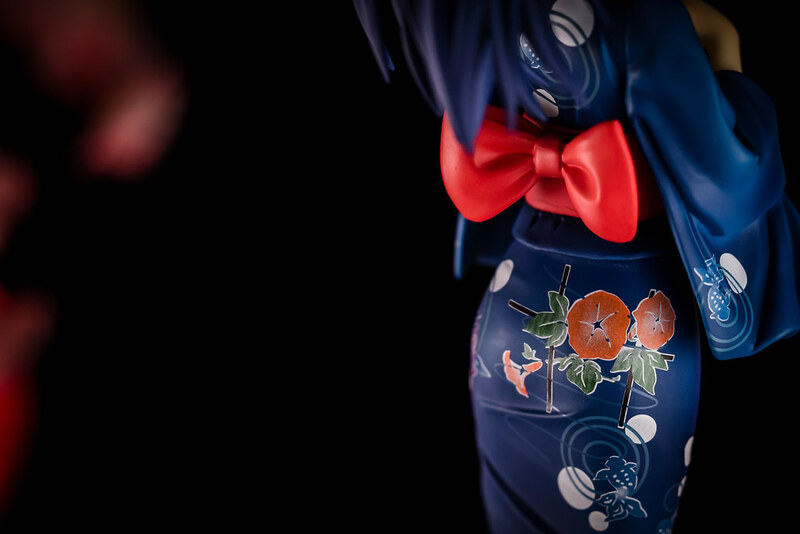 The splashes of red with the flowers and ribbon just compliment her colors. Her ponytail has a nice swaying motion and showcases the sexiest part in a woman, the beautiful delicate nape. That is one of the reasons ponytails increase a girl's cuteness after all! 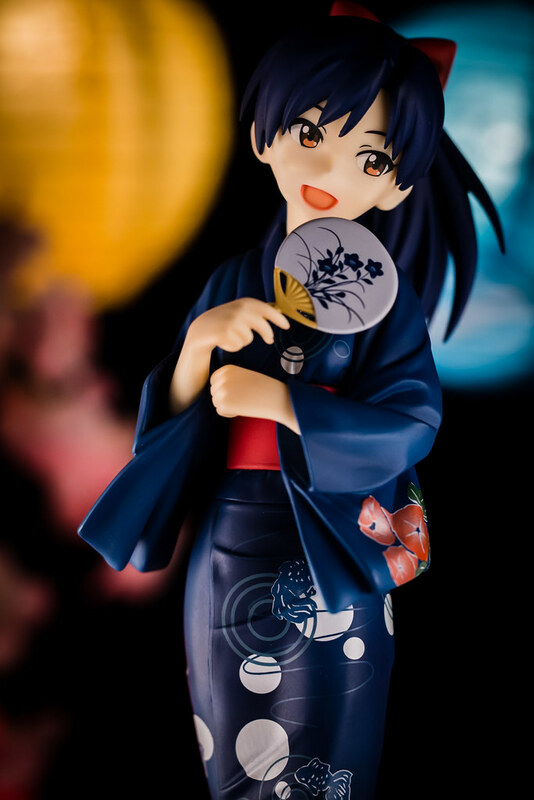 While serious, broken on the inside Chihaya is nice and all, seeing this depiction having fun is pretty nice too. 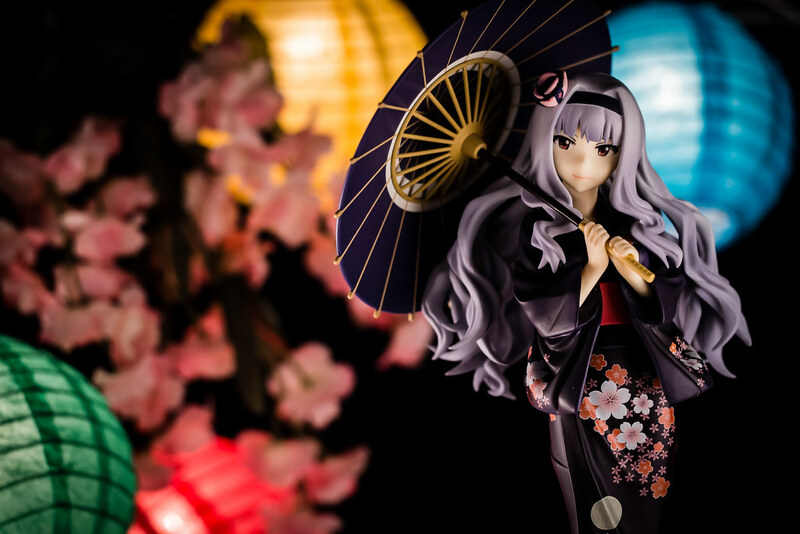 However, the idol that looks best in a yukata is without a doubt is Takane. You can tell she comes from the Old Capital, the elegance of her posture, the way she carries herself just sets her apart. While her image is definitely one of elegance I always found it very amusing with how eccentric she can be at times. I can't help but find it charming when she expresses joys at the simplest of things or her love of food. I suppose when you are from the moon even small things are a new experience. 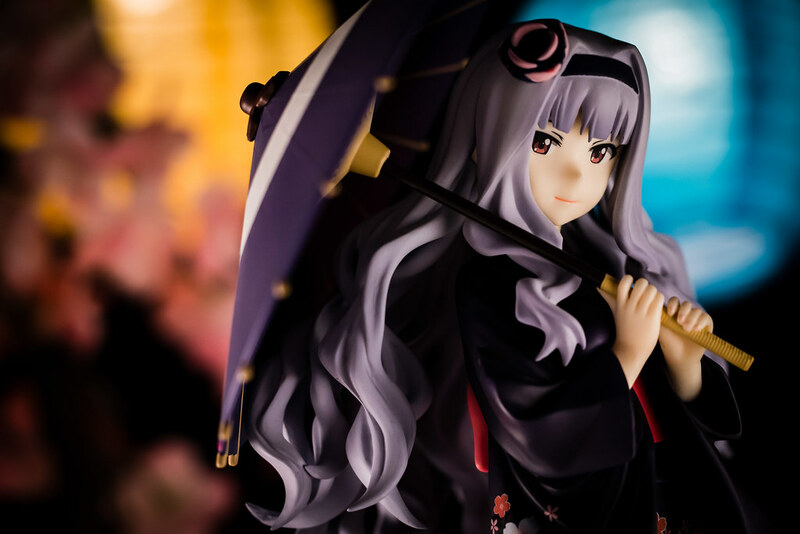 The darker color scheme of her yukata really highlights her more mature charm when compared to the other girls. 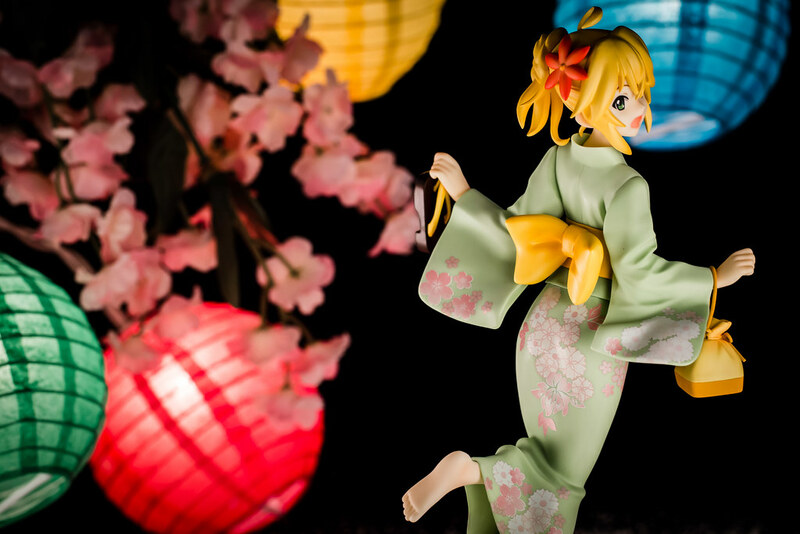 The flowers once again accentuate the yukata with the moon as a nice focal point. A shame FREEing ended up changing the design slightly and removing the clouds covering part of the moon. Her flowing long wavy hair looks very alluring, I'm glad FREEing did not end up putting some horrible seam lines along the hair. 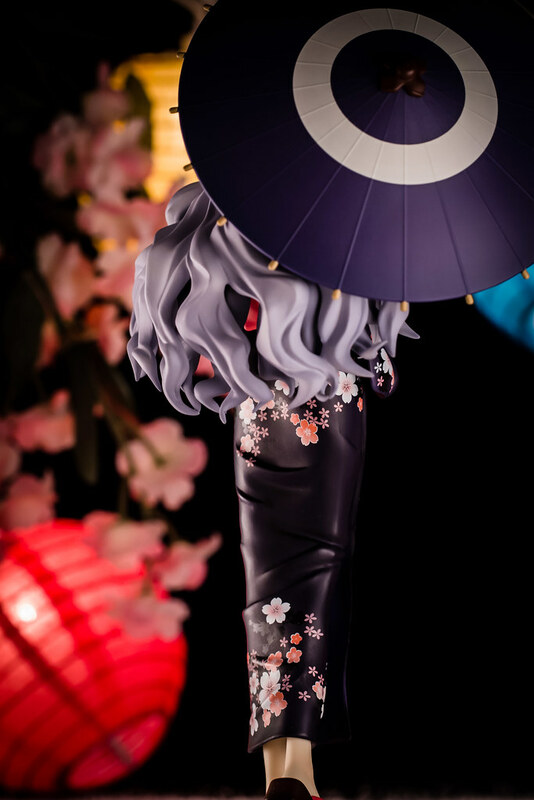 The umbrella looks fairly nice but I think it missed the paper texture and sadly looks like just a piece of plastic. A bit of a shame, could have really been a nice plus on the figure. 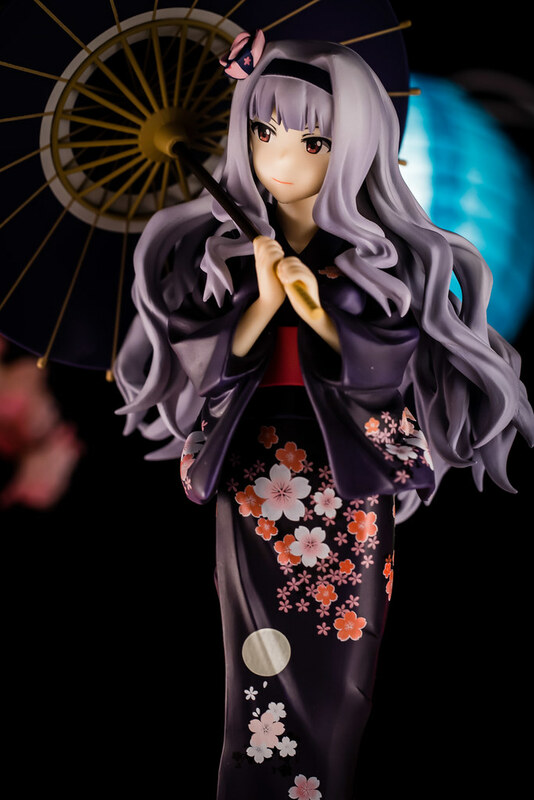 I can forgive that though, just looking at Takane's demure smile makes me all ready to fall in love whenever I set my eyes on her. A few years back I saw a couple of their works, they were a bit rough here and there but fast forward to today and I got almost no complaints. My first experience was pretty good, for my second first hand experience with FREEing I'm not disappointed by their work. Over all I think the three girls look excellent! I would have been happy with just any one of them but that I would get the chance to get such a nice set like this with all my three favorites makes me nothing short ecstatic.